Herkese merhabalar! Blogta cok uzun süredir yeni bir yazi gelmedi, ancak bunun bir sebebi var! Gectigimiz aylarda sürekli bir yerlerdeydim, yaz aylarinin yogunlugu bir yana, biraz da kendime vakit ayirmak istedim. Ancak beni sosyal medya hesaplarimdan takip edenler zaten neler yaptigimi, nerelere gittigimi biliyorlar - Istanbul'a ugramadan olmaz! Anlatacak, yazacak o kadar cok sey birikti ki... bu yaziyla baslayalim. Boool fotografli postuma hosgeldiniz! Hi everyone! It has been a while since I have not uploaded any blog posts for you, but for a reason! In the past months I have been traveling a lot and enjoyed the hot summer days traveling and by the beach. But the ones who follow me on my social media accounts are up to date and know that I had been in Istanbul for a few weeks, too. Let's start from there... hope you enjoy my post filled with looooots of pics! Bir teras hayal edin simdi. Yüksekte, kargasadan uzakta, sabah kahvenizi huzurla yudumlayip Istanbul'un tazeligini icinize cekebildiginiz bir teras. Evlerin catilarini dahi rahatlikla görebildiginiz, Istanbul'un en üstünde oldugunuzu hayal edin. Ve Bogaz'i... ve köprüyü... Size Istanbul'u, bir ressamin ustalik eseriymiscesine gösteren o terasi hayal edin, ve o tabloda sizin de yer aldiginizi. Iste o teras, Le Méridien Istanbul Etiler'de kaldigim süite ait. Bu yazimda sizlere Istanbul'daki günlerimden bahsedecegim ve kaldigim oteli tanitacagim. Ancak otel deyip gecmemek lazim, Bogaz'da bir rüya adeta! Imagine a terrace. A terrace you can enjoy your morning coffee at and which is higher than the other buildings around. Imagine that you have the whole metropolis under your feet. And the Bosphorus... and the bridge... Imagine Istanbul at its finest! 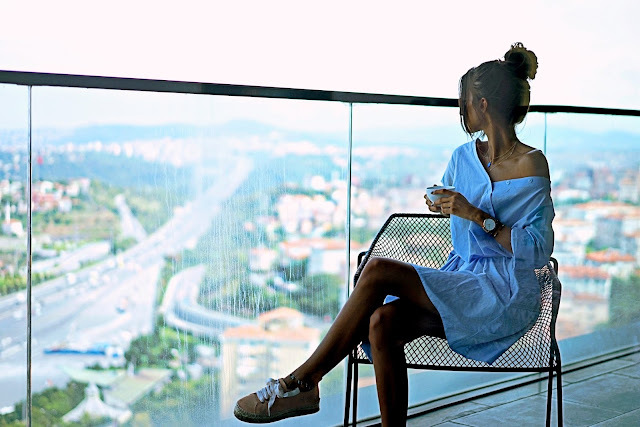 Well, I had the chance to let all these come true on the big terrace of my suite at Le Méridien Istanbul Etiler. In this post I want to talk about my experiences at this amazing hotel by the Bosphorus. Le Méridien, 47 ülkede 150'ye yakin otelle temsil edilen Paris dogumlu bir otel markasidir, Türkiye'deki ilk oteli ise bu yazinin konusu olan Le Méridien Istanbul Etiler. Isminden de anlasildigi üzere otelin konumu Istanbul'un lüks semti Etiler'de. 34 katli otel, konforlu ve lüks konaklamanin yani sira misafirlerine muazzam lezzetler, spa ve spor gibi cesitli deneyimler sunuyor ve panoramik manzarasi ile Bogaz'i seyrediyor. Ulasim cok rahat. Örnegin Besiktas Iskelesi'ne aracla sadece 15 dakikalik bir mesafede yer aliyor. Havalimani mesafeleri ise söyle: Atatürk Havalimani 30 km, Sabiha Gökcen Havalimani ise 40 km. 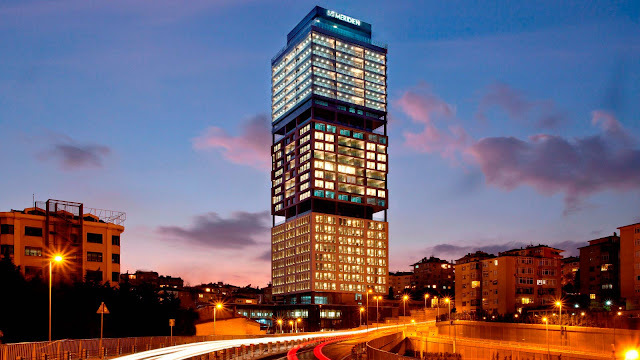 Some general information: Le Méridien is a Parisian hotel brand which is presented with almost 150 hotels in 47 countries all over the world. Their first hotel in Turkey is Le Méridien Istanbul Etiler which is located in the upscale neighbourhood Etiler in Besiktas/Istanbul. The hotel is 34 stories high and offers its guests a pleasant and luxury accommodation with a breathtaking panoramic view over the Bosphorus, delicious food, spa, fitness and many other opportunities. Getting there is totally easy. The Besiktas port, for example, is only 15 minutes away by car so the hotel is located in the center of Istanbul. Distances to the airports: Atatürk Airport 30 km, Sabiha Gökcen Airport 40 km. When we arrived at the hotel, the hotel staff welcomed us very warmly and were friendly and super attentive during our whole stay. And I have to highlight one thing: I have been to many hotels but the service at Le Méridien took everything to a whole new level - it was the best service I have ever experienced so far. After we have checked in, we were guided to our room which was on the 23rd floor. Öncelikle konakladigimiz odanin türünün Premium Executive Süit (Oda No: 2303) oldugunu belirtmek istiyorum. Otelde farkli türde odalar ve süitler bulunmakta, isteklerinize ve bütcenize göre degisiklik göstermekteler. Eger dilerseniz odalara iliskin detayli bilgiyi Le Méridien'in kendi websitesinde inceleyebilirsiniz. Bu yazimda ben sadece kendi deneyimlerimden bahsedecegim icin sözkonusu odamiz Premium Executive Süit olacak. Surprise, surprise! It was a Premium Executive Suite (Room: 2303). The hotel offers different types of rooms and suites of course, so for detailed information you can take a look at their website. In this post I'll show you only the one we stayed at - and it was the premium executive suite. Gercekten muazzam degil mi? Güne bu manzarayla baslayip, bu manzarayla uykuya dalmaya sabirsizlaniyordum. Oturma odasinin yani sira süitimizde tabii ki bir de ayri yatak odasi bulunmaktaydi. Hemen yatak odasindan da genis banyoya gecis vardi. Banyo, iki lavabo, wc, küvet ve dustan olusuyordu ve inanilmaz genisti. En cok da küvet hosuma gitti, Istanbul manzarasiyla banyo yapmak rüya gibi geliyor kulaga. Isn't that amazing? Couldn't wait to start the day and to fall asleep with a view like that. We really didn't know where to start enjoying :P. Taking a power nap? Or rather taking a bubble bath with the Bosphorus view? I was sure that our days in this suite would be dreamy indeed! Anlayacaginiz, süit inanilmaz genis ve konforlu. Istanbul'da keyifli vakit gecirip lüks bir yerde konaklamak isteyenlere kesinlikle tavsiye edebilirim. Ama süitin en can alici noktasi bence terasi!!! Bu teras size tanidik geldi mi? Fi dizisini izleyenler hemen taniyacaktir - Can Manay'in 12. bölümde depresyona girdigi teras bu. Ah Can Manay, böyle bir yerde depresyona girilir mi? Well, our suite was super spacious and comfortable. I can warmly recommend this suite to those who are looking for a luxury accommodation in Istanbul. The most amazing thing about the suite is its spacious terrace with a view over the whole metropolis and the Bosphorus. Totally fascinated by it! Süitten cok memnun kaldik ve keyifli vakit gecirdik. Cok rahat ve konforluydu, servis ise yazinin basinda da söyledigim gibi tek kelimeyle mükemmeldi. Özellikle gece yataga uzanip sehrin isiklarini seyrederek uyumak essiz bir deneyim oldu. This city never sleeps! I really enjoyed the warm lights of the night and the dark beauty of Istanbul while falling asleep in my comfy King sized bed. And good morning world! When I woke up in the morning, I had much energy to start the day. So we jumped out of our bed and got ready for the breakfast at the hotel's restaurant which is called La Torre Restaurant. Kahvaltiyi kacirmamanizi öneririm, zira her sey özenle hazirlanmisti ve güzel görünüyordu. Genis kahvalti büfesinde akliniza gelebilecek her sey mevcut - taze ekmekler, müsliler, sebzeler, meyveler, cesitli peynirler ve receller ve daha fazlasi... Büfe zengin ve her seyin cesidi mevcut, dolayisiyla herkesin damak zevkine uygun bir seyler var! I can warmly recommend the breakfast buffet - it was rich and fresh and offered everything imaginable from fresh bread to muesli, vegetables, fruits, various types of cheese and jams, and and and... perfect for everyone! La Torre Restaurant is inside the hotel complex. You can have your breakfast inside the chic restaurant or by the pool. It's not that difficult to guess which one I have prefered :P. Everything was super tasty! "Avokado ve Somon Füme Salatasi"
Hazir lezzetlerden bahsetmisken aksam yemegine deginmezsem olmaz! Otelde kalmasaniz dahi, eger bir aksam şık bir aksam yemegi yiyeyim diyorsaniz Le Méridien'in La Torre Restaurant'ini bunun icin tercih edebilirsiniz. Sefin yarattigi o nefis lezzetleri tatmaniz lazim!!! Baslangic olarak size Avokado ve Somon Füme Salatasini tavsiye edebilirim - inanilmaz lezzetliydi! Arkadasim ise Bonfile Salatasini tercih etti ve hayran kaldi. Dinner is also served in the same restaurant. When we got there, our table was already prepared for us - the staff was always so attentive and knew that we would prefer the table by the pool! Couldn't wait to taste the delicate meals! I can absolutely recommend the Avocado and Smoked Salmon Salad!!! OMG, it was the best avocado salad I have ever tasted! My company chose the Beef Tenderloin Salad and liked it also! Ana yemek olarak ben Bir Dakikalik Eti tercih ederken, arkadasim Gurme Kebabi deneyimledi - ve ikimiz de cok begendik. Ama benim size kesin tavsiyem: Bir Dakikalik Et! Hic fazla söze gerek yok - MU AZ ZAM ! Sefin ellerine saglik! La Torre Restaurant'inin yani sira, yeme icme icin ayni zamanda otel icinde Latitude Bar, L'Eclipse Bar ve Club Lounge'u tercih edebilirsiniz. As main course I enjoyed the Minute Steak and my company took the Gourmet Kebab and both of us enjoyed the delicate meals! I especially can recommend the Minute Steak, so so delicious! 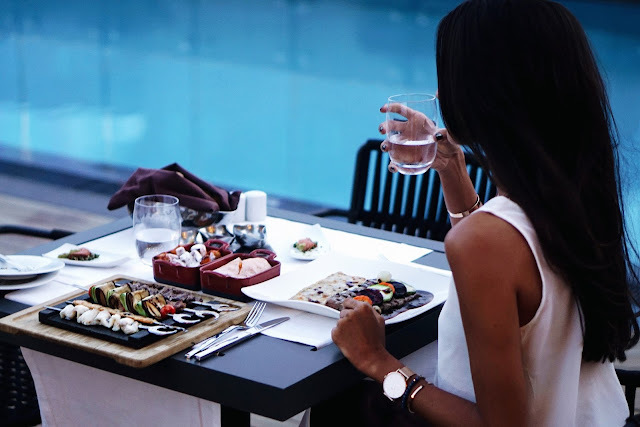 Besides La Torre Restaurant, there are also some other dining areas like the Latitude Bar, the L'Eclipse Bar and the Club Lounge where you can enjoy yummy snacks and drinks at. Dedigim gibi, kahvalti ve aksam yemegi otelin La Torre Restaurant'inda servis ediliyor. Bu restaurantin dis cephesinde ise gün icinde kullanima acik olan acik yüzme havuzu var. Eger kapali havuzda yüzmeyi tercih ediyorsaniz otel kompleksinde kapali havuz da mevcut elbette. Böylece yaz kis demeden havuzun keyfini cikartabilirsiniz. Havuza girmek istemeyenler de acik havada sunulan oturma olanaklarinda keyifli vakit gecirebilirler. The hotel offers also a spacious spa and fitness area. There are two swimming pools, one open air pool and one indoor pool. You can enjoy the clean water or just relax by the pool on stylish porch swings. Dinlenmek ve rahatlamak icin ise otelin 3. katinda bulunan genis spa alani Explore SPA'nin sundugu olanaklardan faydalanabilirsiniz. Özel masaj ve terapilerden tutun, buhar odalari, Türk hamami, dinlenme odalari ve fitness salonuna kadar her seyiyle genis bir ayricalik sunuyor. If you would like some wellness time, you can visit the spa area which is called Explore SPA at the 3rd floor of the hotel. The spa offers refined spa services and treatments in exotic massage rooms and relaxing facilities like sauna, steam room, whirlpool and a traditional Turkish Bath (hamam). Next to the spa you can also find a spacious fitness center which is open 24 hours a day. Istanbul'un canliligindan ve yogunlugundan 1-2 saat de olsa uzaklasmanin iyi bir fikir olacagini düsündüm ve kendimi Explore SPA'ya attim. Terapinin yapildigi odalar bedeni ve ruhu dinlendiren egzotik bir tasarimla düzenlenmis ve kisiye farkli bir deneyim sunmakta. Masaj icin öncesinde randevu almaniz gerekmekte, ben de öyle yaptim ve 60 dakikalik Isvec Masaji'ni tercih ettim. Masajlar uzman terapistler tarafindan gerceklestirilmekte, dolayisiyla emin ellerdesiniz. 60 dakikanin ne kadar cabuk gectigini ve ne kadar rahatlatici oldugunu anlatmama gerek var mi? O kadar iyi geliyor ki! Isvec Masaji, bütün masaj türlerinin temeli olarak kabul edilmekteymis. Kaslarin rahatlamasina, kan dolasiminin uyarilmasina ve enerji akisinin artirilmasina odaklanirmis. Öyle de oldu. Kesinlikle deneyimlemenizi öneririm. As you know, Istanbul is a very dynamic metropolis. In order to relax a little bit, I booked a treatment at the Explore SPA, but before the massage treatment I enjoyed the steam and Turkish Bath and later the massage. I have chosen the Swedish Massage (60 minutes) and it was sooo so soothing and relaxing! Loved it and can absolutely recommend it to everyone! After the treatment I felt as if I have been spiritually and physically reborn. Le Méridien'de zaman hizla akiyor, yapilacak o kadar cok sey var ki insan nereden baslayacagini bilmiyor. Bu yüzden zaten basli basina bu oteli deneyimlemeye deger, sundugu olanaklar cok fazla. Aksam ise eglenmek ve nefis kokteyller denemek icin otelin 34. katinda bulunan L'Eclipse Bar'i tercih edebilirsiniz. Barin muazzam bir panoramik manzarasi var, dolayisiyla Istanbul isil isil ayaklarinizin altinda. Dilerseniz terasinda, dilerseniz de ic mekanda dünyaca ünlü DJ performanslari esliginde eglenebilirsiniz. Our days at Le Méridien were filled with lots of relaxing stuff as you can see. The hotel is just a dream and offers so many facilities! 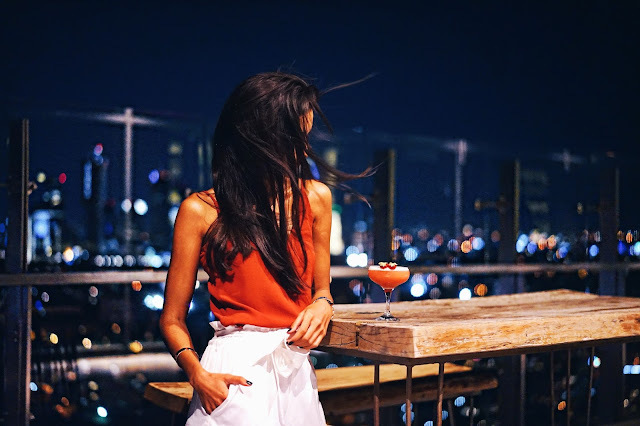 After we spent our day exploring the hotel complex, we rounded off the day at the L'Eclipse Bar at 34rd floor in the evening. 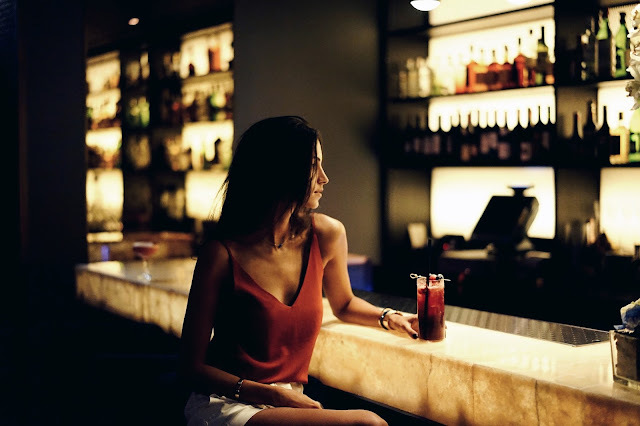 The bar offers a breathtaking panoramic view over Istanbul and you can see the lights of the metropolis dancing. No matter how - on the terrace of the bar enjoying the view with a delicious cocktail or inside, dancing to the vibes of world-famous DJ performances - you can have so much fun here! Genel anlamda inanilmaz memnun kaldik ve keyifli vakit gecirdik. Istanbul'da konforlu ve lüks bir konaklama arayisinda olanlar Le Méridien Istanbul Etiler'i kesinlikle tercih edebilirler, pisman olacaklarini hic zannetmiyorum. Essiz panoramik manzarasiyla, lezzetli yemekleriyle, konforlu odalari ve cesitli ayricaliklariyla tüm isteklerinizi karsilayabilecek potansiyele sahip bir otel. Cok fazla seyahat ettigim icin otelleri kendi aralarinda karsilastirma imkanim var, ancak her birinin özelligi farkli oldugu icin direkt bir siralama yapmayi uygun görmüyorum. Ama su kadarini söyleyeyim, siralayacak olsam Le Méridien Istanbul Etiler net ilk 3'e girer! So summing up, we really enjoyed our stay at Le Méridien Istanbul Etiler and can recommend it to everyone who look for luxury and comfort. Everything was just amazing - the panoramic view, the delicate meals, the comfort of the suite and the plenty facilities the hotel offers. If I had to put the hotel into a ranking of the top hotels I have ever been to, it definitely would be one of the first! Ilgisini asla eksik etmeyen güleryüzlü ve yardimsever Le Méridien ekibine ve özellikle Marketing Team, sevgili Sevi Hanim ve Aybike Hanim'a, misafirperverliklerinden ve ilgilerinden dolayi tesekkür ederim. Sayelerinde konaklamamiz essiz bir deneyim oldu! Many thanks to the whole hotel staff and especially to the marketing team - dear Sevi and Aybike - who gave us unforgettable impressions and made our stay just amazing! In cooperation with Le Méridien Istanbul Etiler. Portraits taken by Ridvan Macit.